Prior to his time in the Atlantic League, the 32-year-old spent time in the San Francisco Giants (2008-09), Boston Red Sox (2010-11, ‘13) and Chicago Cubs organizations (2012). 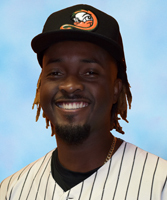 Additionally, he has played two seasons in the Frontier League with the Gateway Grizzlies (2012-13) and three in the American Association with the Kansas City T-Bones (2014-16). While with Kansas City, he recorded 268 hits in 270 games along with 100 RBIs, 133 runs, 39 doubles, 92 walks and 62 stolen bases. Frias was originally drafted by the Giants in the 30th round of the 2008 amateur draft out of Tennessee Wesleyan College.